The province of Chaiyaphum is one whose main claim to fame among Thais is assuredly the quality of its home-made silk. The few Western visitors who make it to this remote part of Isaan are likely to be fans of Thai silk who are coming to see the silk production process or to buy samples for their connection. There is, however, another reason why the cultural tourist might visit this quiet, rural province and that it is track down its considerable array of relics from its Mon-Dvaravati history. From approximately the 6th to the 13th centuries, the inhabitants of this part of the country were ethnic Mon who practiced Buddhism. The best place to get some sense of this little-known period of history is at Ban Kut Ngong, a small village about twenty kilometres from the centre of downtown Chaiyaphum, such as it is. 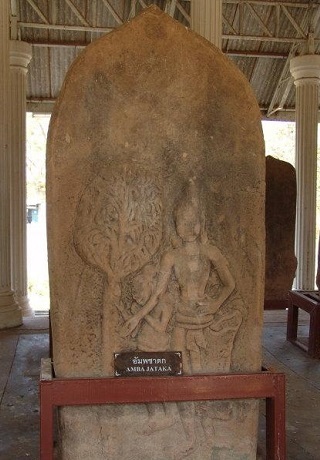 In one sense, it makes senses there was an ancient Buddhist kingdom in the area, as the name Chaiyaphum has a rather grand meaning in Sanskrit/Pali. ‘Chaiya’ is a Thai variant of the word ‘jaya’, which means ‘great’ or ‘glorious’ through the Malay world. ‘Phum’ is derived from ‘bumi’, meaning soil or land.The name of the province means ‘glorious land’ then, which would hint at least some importance in history. The earliest trace of any kingdom in this area was during the Mon period, when Buddhist scriptures brought knowledge of Sanskrit to what is now Thailand, serving as the state religion of small local kingdoms whose capitals were in oval-shaped, moated settlements. These settlements are one of the trademarks of a major Mon city or proto-kingdom. The village of Ban Kut Ngong was never the capital of a Mon proto-kingdom. We will discuss where that might have been in a later post. What we can find in this village is an amazing collection of bai sema, the carved boundary stones which another one of the hallmarks of the Mon period. They are collected beneath a galvanized iron roof on the grounds of a temple. There are about twenty of them in total, making this little village home to an extremely valuable collection of artefacts, each more than a thousand years old. These bai sema have been rounded up and relocated to this one site but they were found from a variety of sites around the village, suggesting there was once a sizable Mon-Dvaravati settlement there. In terms of their function, you could think of them as talismans, which were thought to have magic power that would protect the structures nearby, typically monastic ordination halls (ubosots). Therefore, in moving them to a single shed, violence has been done to the intentions of the ancient Mon, as their placement was highly meaningful. Nonetheless, it does have the advantage of making them easier to guard and protect. There are many beautiful carvings in shallow relief on these stones, and the art historian could probably spend hours analyzing the stylistic features of the carvings. For the casual visitor, there are a couple that particularly stand out. One remarkable one features a Buddha seated in the lotus position on what seems like a towering throne, with the bodhi tree over his head. Perhaps the most beautiful of all is of a very graceful and feminine standing Buddha with a robe tied around his waist and his torso naked. There is a huge cloud around his head, which represent his aura of mystical power. This reminded us of other bas reliefs from the Mon period in Isaan, including those beaten into gold foil at Sri Thep. The artwork here is certainly extraordinary, making this one of the finest Mon sites in all of the Northeast.